USACE Charleston District has requested that EPA Region 4 approve a modification of the existing Charleston ODMDS disposal zone in accordance with Section 102 of the MPRSA to ensure that long-term ocean disposal site capacity is available for suitable dredged material generated from new work (deepening) and maintenance projects in support of the Charleston Harbor Federal Navigation Project and other local users. 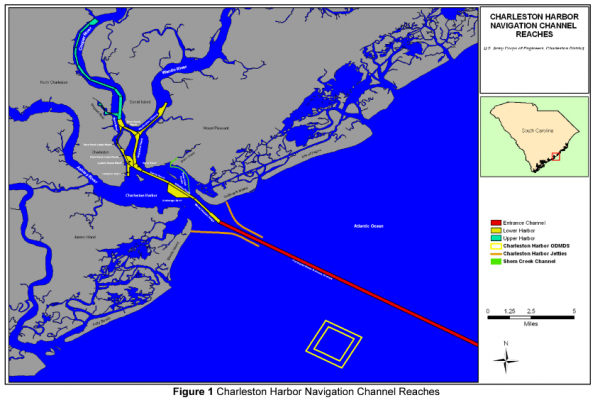 The existing 4 mi2 (3.0 nmi2) Charleston ODMDS disposal zone is approximately 9 miles southeast of the entrance to Charleston Harbor. The proposed action evaluated in this environmental assessment (EA) is an expansion of the Charleston ODMDS disposal zone. Additional ocean disposal capacity is needed to support ongoing navigation channel maintenance and capital improvement projects that are essential for continued economic growth in the region. The size of the proposed ODMDS modification area is based on current capacity modeling of the existing disposal zone within the Charleston ODMDS, historical dredging volumes, future dredging volumes for new work and maintenance projects, estimated shoaling rates, and capacity of upland CDFs in the area.